Actually freestyle really comes from 'Planet Rock'. 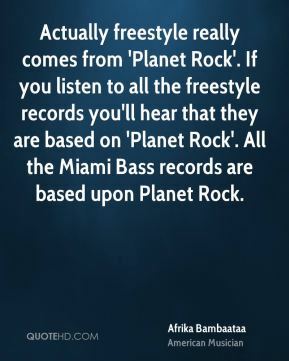 If you listen to all the freestyle records you'll hear that they are based on 'Planet Rock'. All the Miami Bass records are based upon Planet Rock. 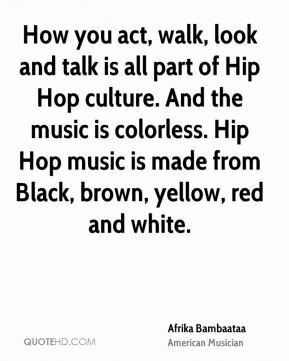 How you act, walk, look and talk is all part of Hip Hop culture. And the music is colorless. Hip Hop music is made from Black, brown, yellow, red and white. 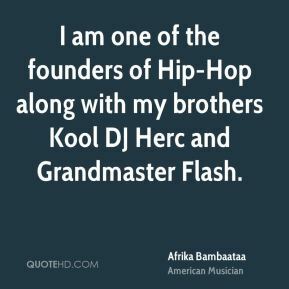 I am one of the founders of Hip-Hop along with my brothers Kool DJ Herc and Grandmaster Flash. 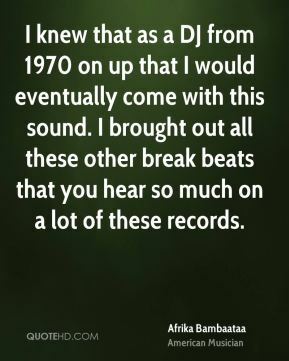 I knew that as a DJ from 1970 on up that I would eventually come with this sound. I brought out all these other break beats that you hear so much on a lot of these records. 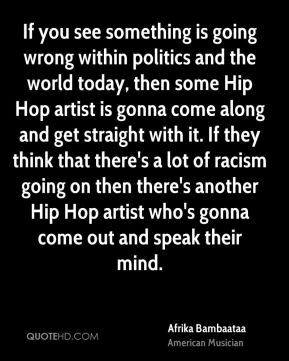 If you see something is going wrong within politics and the world today, then some Hip Hop artist is gonna come along and get straight with it. If they think that there's a lot of racism going on then there's another Hip Hop artist who's gonna come out and speak their mind. Since the pharmaceuticals don't make any money and they control the doctors. If the doctors don't make any money then all hell breaks loose. 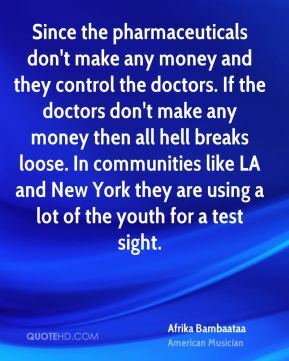 In communities like LA and New York they are using a lot of the youth for a test sight. 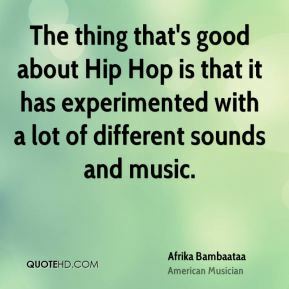 The thing that's good about Hip Hop is that it has experimented with a lot of different sounds and music. There are certain things that they say you can't do, there are all these secret people behind the scenes who make things available for you to do. 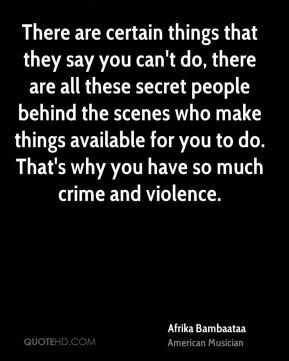 That's why you have so much crime and violence. There's a lot of people over time who have brought out all these funky records that everybody has started jumping on like a catch phrase... 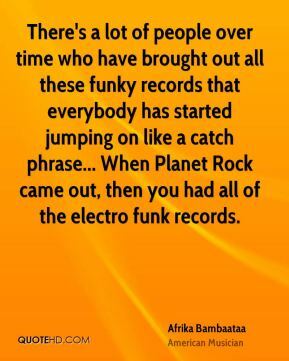 When Planet Rock came out, then you had all of the electro funk records. They allow us to disrespect our Black woman. A lot of these things would be considered criminal if it were to be carried out in the streets. That's like when they tell you after you buy your VHS and you rent movies they tell you not to copy the movies. They're keeping friction going between people from the East and the West. 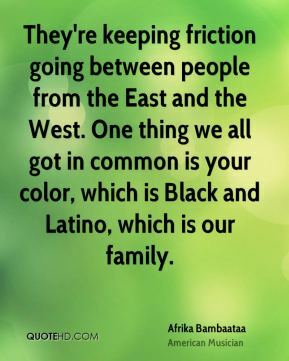 One thing we all got in common is your color, which is Black and Latino, which is our family. We also want to try and slow down all this foolishness that's going on between the East and West. We gotta understand that Hip Hop is now universal. 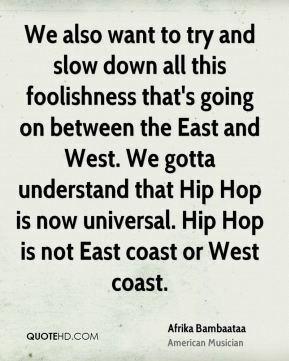 Hip Hop is not East coast or West coast. We want you to sit down and leave your egos at home and let's get an understanding as to where all this is foolishness coming from. 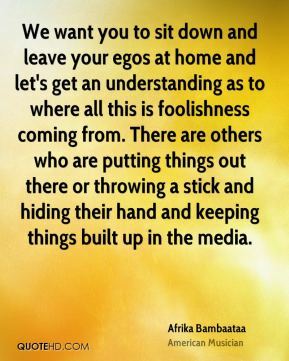 There are others who are putting things out there or throwing a stick and hiding their hand and keeping things built up in the media. 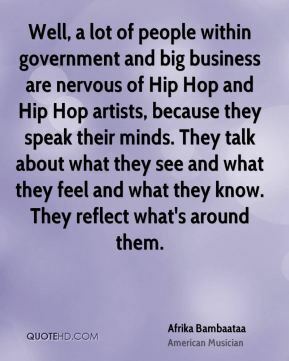 Well, a lot of people within government and big business are nervous of Hip Hop and Hip Hop artists, because they speak their minds. They talk about what they see and what they feel and what they know. They reflect what's around them. 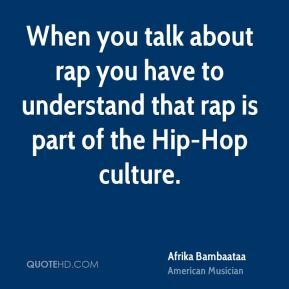 When you talk about rap you have to understand that rap is part of the Hip-Hop culture. You have to look at the fact that Hip Hop is under attack. 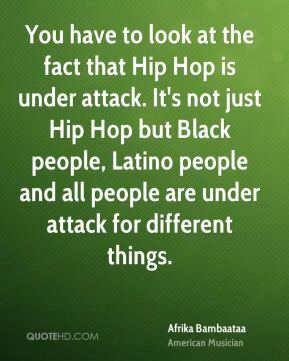 It's not just Hip Hop but Black people, Latino people and all people are under attack for different things.